In 2008 I joined forces with fellow artist Fern Smith in creating The Art of Suff-Rage traveling art installation. 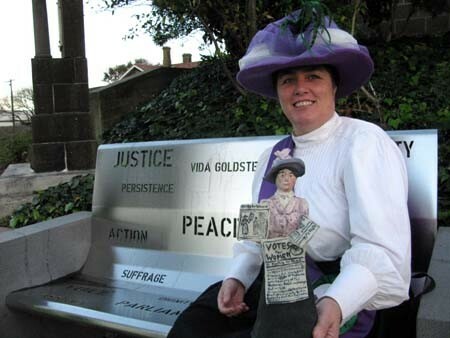 The project sees us roving Victoria dressed as suffragist giving out the latest edition of our newspaper. 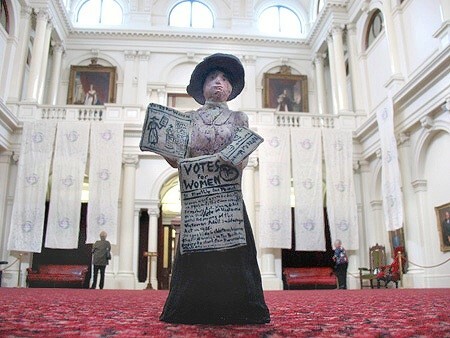 The installation celebrates the Centenary of Women’s Suffrage in Victoria and I have created one hundred ceramic suffragist sculptures each around 30cm in height. 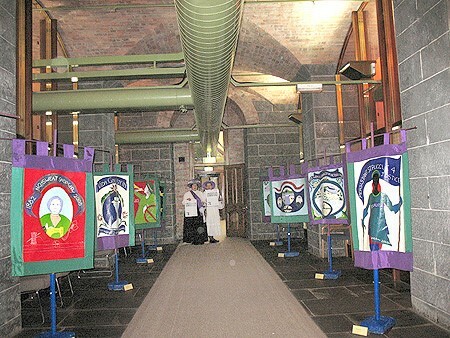 Fern has painted ten commemorative banners to honor the legacy of women campaigning for equality. 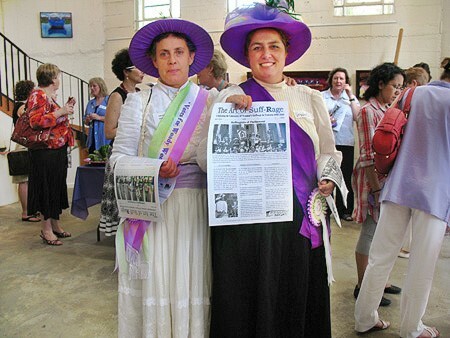 Gasworks Arts Park has auspice the project and we received funding from the Department of Planning and Community Development Grants Program-Centenary of Women’s Suffrage. Thank you to everyone who has helped to get the project up and running. Fern and I ventured to Portland recently with The Art of Suff-Rage traveling art installation for an exhibition of our work. 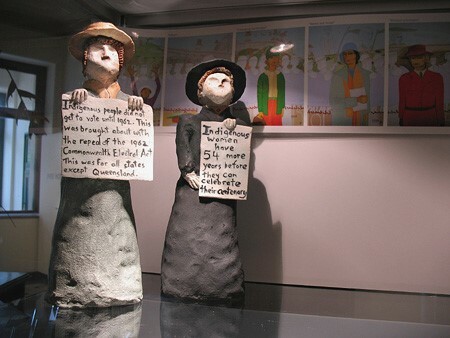 The exhibition consists of the entire body of work that we produced last year for the centenary celebrations of Victorian Women Vote 1908 – 2008. As Portland was the birth place of Vida Goldstein it was fantastic we had this opportunity to explore more of her adventures. 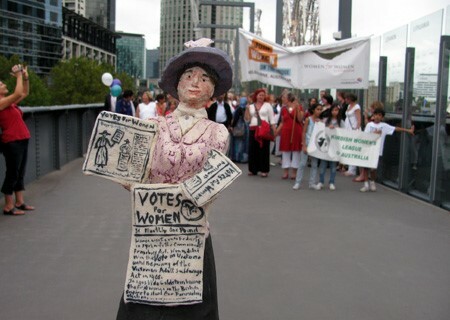 Here is a picture of me and Vida on the Victorian Women Vote 1908 – 2008 “Seat for Vida” made by artist Carmel Wallace. Fern and I attended the Queen Victoria Women’s Centre annual International Women’s Day celebrations. 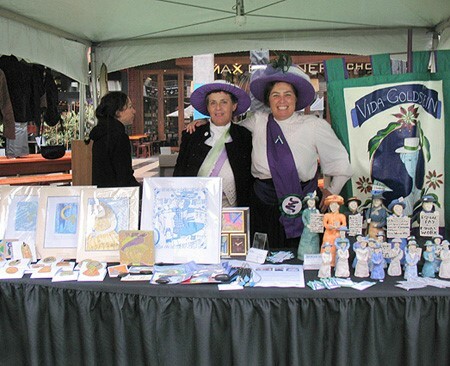 Women entertainers and stalls holders from various women’s organizations as well as artists and produces filled the QV Square for a fun filled informative event. 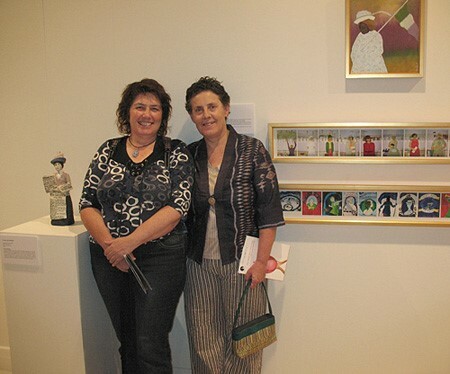 Each year Counihan Gallery in Brunswick hosts a Women’s Salon as part of IWD celebrations showcasing the work of women artists from the City of Moreland. As the theme for this year was “Stories of Hope” both Fern and I submitted works created for The Art of Suff-Rage We are pictured below after I gave a floor talk one Saturday afternoon. 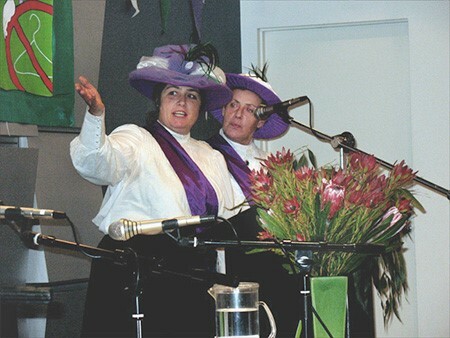 This year Open day celebrated the achievements of women over the last 100 years in celebration of the Centenary of Victorian women gaining the vote. Visitors to the Parliament were greeted by Fern and I on the steps giving out the Sixth Edition of The Art of Suff-Rage newspaper. 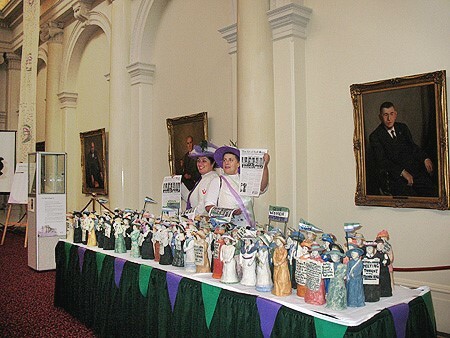 My 100 ceramic suffragist sculptures were on display in Queens Hall and Ferns ten Commemorative Banners were on display in the Members Corridor. People were entertained in the gardens by participants from this years celebrations including Cathy Connors brass ensemble playing her especially composed Centenary Fanfare. The final in the UAW Centenary Celebrations at the Incinerator Art Complex in Moonee Ponds. Fern and I were guest speakers and our art installation was on display. We were invited by The Honorable Jenny Lindell MP the Speaker of the House to the closing of this years celebrations. I took my Vida sculpture along to take part in the festivities and she was very at home in the Queen’s Hall as you can see by the photo. Many of the grant participants from this year were there as well as Ministers and the Premier John Brumby. The steps of Parliament were adorned with signatures collected this year to honor the Monster Petition of 1891. 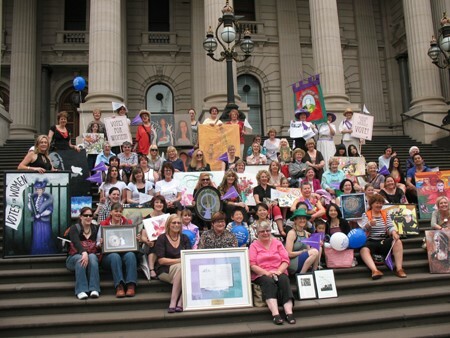 In that year the Premier of the time wanted proof the women of Victoria wanted the vote and with in six weeks women collected over thirty thousand signatures. 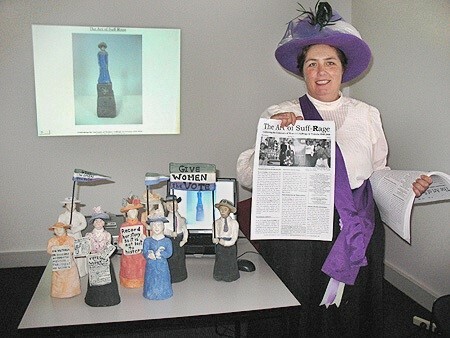 I presented a talk on the ”tales of the suffragists”. On November 7th hosted its final wrap with the unveiling of the “Woady Woman” sculpture commissioned from me. During the year the community researched and voted on who should become the “Woady Woman”. 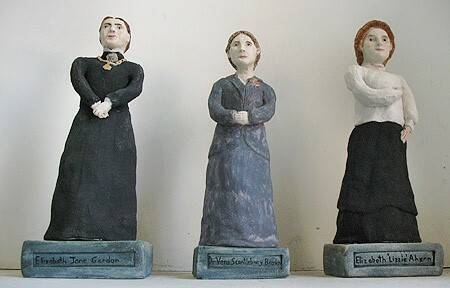 I made three ceramic sculptures of the women chosen which will now reside at the Haddon and District Community House. 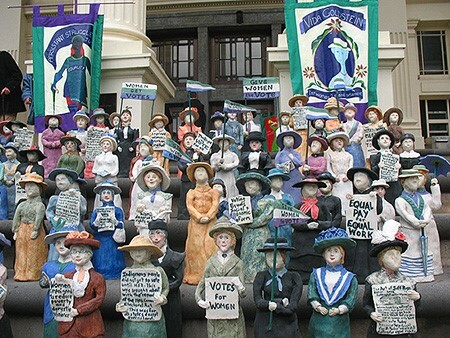 Centenary of Victorian Women Vote celebrations continued on Sunday the 26th of October with “a walk of art”. Women gathered at Federation Square with art works in tow to a welcome address by Judy Madigan the first woman speaker of Parliament. We were then treated to a live performance by Lisa Edwards. We walked with our art to Parliament House were we were greeted on the steps by Jenny Lindell MP the current Speaker of the House. The group then continued on to the Queen Victoria Women’s Center were an exhibition was mounted from the art works. Fern and I have set up a small installation from The Art of Suff-Rage in the glass cabinet. The exhibition runs until the 28th of November. Thanks to Karen Martin and Wendy Kernan for producing such a colorful, fun and creative event. Fern organized the second “Conversations” which was held at the Gasworks Arts Park on October 14th. 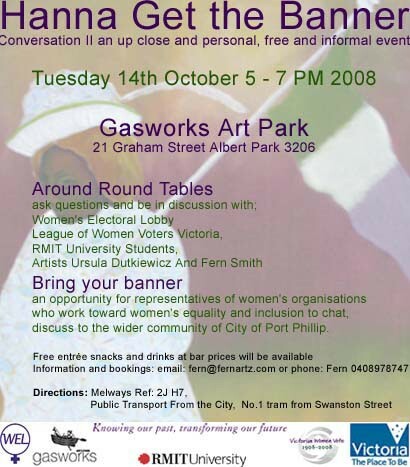 It was an event that brought together organizations such as the Women’s Electoral Lobby, Union of Australian Women, and the League of Women Voters Victoria and RMIT University students. Art works Fern and I created this year for Centenary of Victorian Women Vote celebrations were on display. The relaxed atmosphere allowed for stimulating, informative discussion enjoyed by all those who attended. 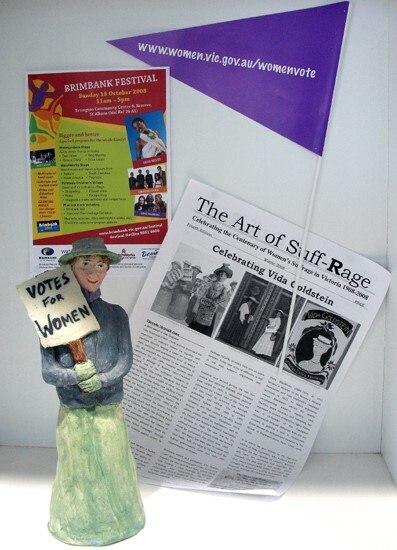 The Art of Suff-Rage will be a feature at this year’s Brimbank Festival on Sunday 19 October 2008 from 11am to 5pm at Errington Reserve, St Albans. 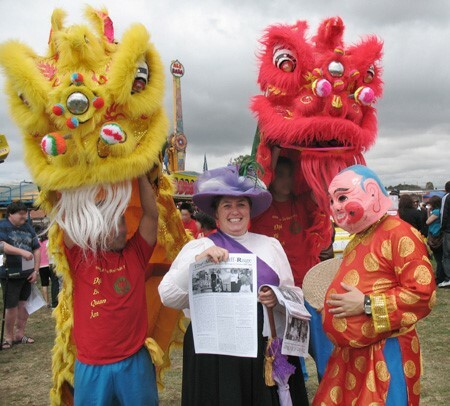 The roving ‘Suffragists” will be out and about with the latest edition of their newspaper. 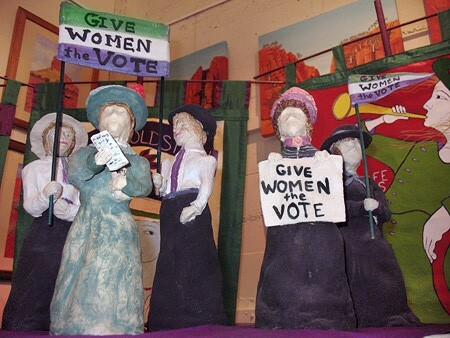 Ferns banners will be on display out the front of the Errington Community Center and a number of Ursula’s ceramic suffragist sculptures are on view in the glass cabinet inside the main entrance. At 1.30pm the Sunshine Brass Band on the Star Stage will play popular tunes from around the time women got the vote in 1908. The ‘Suffragists’ will be there encouraging people to sign a petition honoring the Monster Petition of 1891 which is part of the Centenary of Victorian Women Vote celebrations this year. 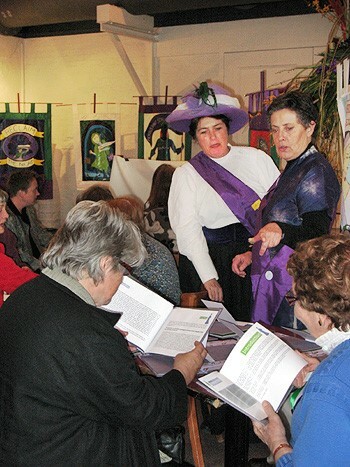 The Greens State Conference for this year chose to celebrate the Centenary of Women’s Suffrage in Victoria by creating an authentic atmosphere for the opening day. Fern and I were invited to attend with a small installation of our work. 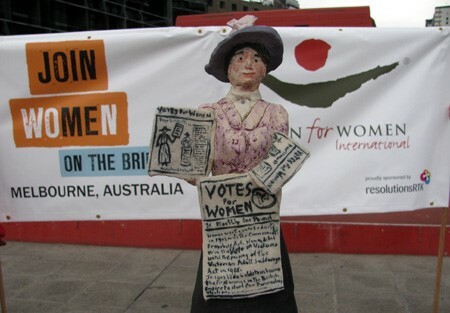 We gave a short introduction to the suffrage movement in Victoria and The Art of Suff-Rage traveling art installation. Conference participants were invited to sign a banner which represented the Monster Petition, a massive document of over thirty thousand signatures which was presented to parliament in 1891. Speakers stood against a back drop of one of Ferns commemorative centenary banners “Our Bodies, Free Safe Abortion” which she pointed out was being debated in the State Parliament at present and a current issue yet again. The Conference acknowledged the importance of women taking part in the political process, echoing the sentiment of the first wave of suffragists and noted women have not yet achieved full equality. The situation for women in Victoria includes -“Domestic Violence is the biggest cause of death and disability for women between 15 and 44 years old. Women earn 80-85% of what men earn for comparable jobs. 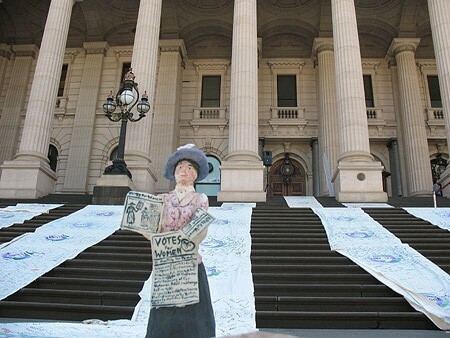 Only 28% of parliamentarians representing Victoria are women”. This was a heartening event to be a part of with a emphasis on women’s involvement in the political process.